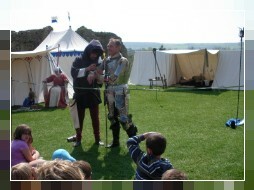 Wolfshead Bowmen Events Group likes to bring historically correct medieval educational entertainment. All members are keen on studying the medieval period in all aspects. We like to show the costumes and fashion of the period 1200-1485. So if there are no special requirements, you may find a diversity of fashionable clothes from three centuries around the campsite. All members bring special arts and crafts or knowledge to an event. We can pick and mix subjects or demonstrations of skills and talks to create in informative and fun day out for all ages. Our knowledge of the Middle Ages is not only based on books and documentation. We like to discuss various aspects of medieval life and sometimes we find out by trial and error. Amongst our members we have historians and archivists, who can study certain aspects first hand from medieval documents, while the teachers amongst our members help us to make our events as educational as possible.